Fall is my absolute favorite time of year, and considering I’m a New Englander, it probably should be. There’s something magical about any changing season, but fall is especially enchanting with it’s cool crisp air, warm spicy beverages and the promise of many feasts and gatherings to soon come. It’s the perfect marriage between snuggling inside and exploring outside and apple picking is a perfect reason to do both! 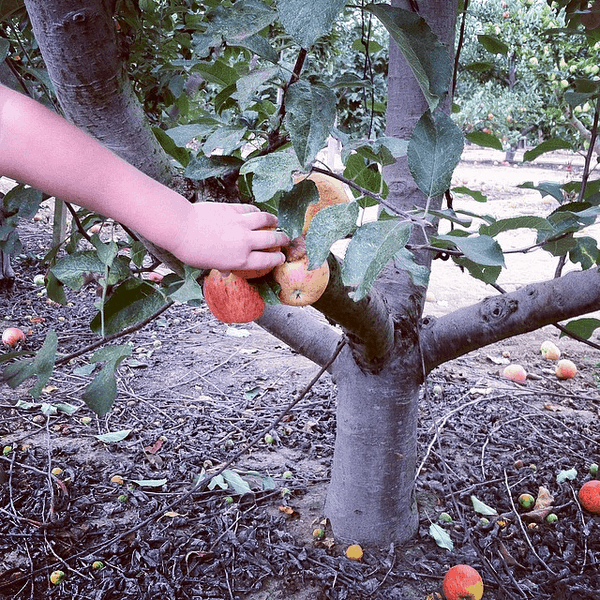 Apple picking is a great activity that the whole family can enjoy together, however, including kids in any activity inevitably makes it more difficult. With that said, here are my tips for making apple picking the wonderful experience it’s meant to be for the whole family. When choosing an orchard, consider what apples they offer, how much walking is involved and whether there are extras like a playground or snack bar, etc. You should also call ahead because crops vary from season to season and you will want to be sure that the orchard is open for picking on the day you want to go. Also, remember that some apples are better for applesauce while others are better for cider and still others are best for baking. Make sure you have a plan to use the apples that are in season. Many people don’t think about apple picking until it starts getting cold out. If you choose to go in the beginning of the season ,you may find that there are fewer people picking and a greater variety of apples to choose from. Plus depending on where you live, picking season might end before the apple season does. 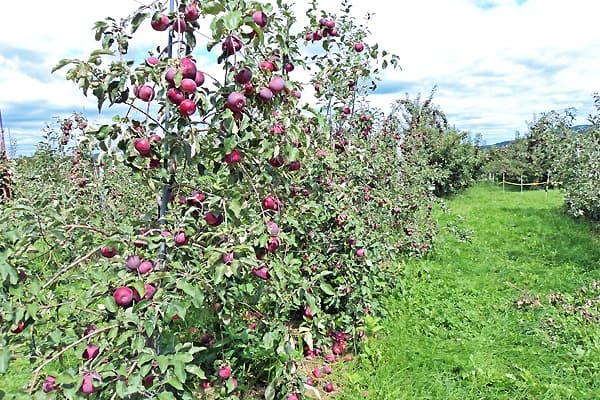 Weekends are obviously busier for apple picking than the rest of the week, so you may want to go apple picking on a weekday when the orchard won’t be as busy. You can also consider the time of day. Orchards are usually busiest in the middle of the day. Going early or late might be a good way to avoid crowds. To get the most out of the trip, prepare your little ones with apple-related books from the library, coloring pages, or choose apple recipes together and talk about what you’ll do with the apples you bring home from the trip to the orchard. And definitely have a plan for dealing with toddler meltdowns and overtired kiddos. Check the weather ahead of time and decide on appropriate clothing for the family. Layers are usually a good choice for apple picking so if you get warm from moving around (or if the sun is especially hot), you can stay comfortable. Choose rubber boots if it’s been wet or sneakers if you’re sure it will be dry. Leave the sandals at home since often orchards have thistles and thorny weeds growing between the trees. If you’re carting along an infant, toddler or preschooler, you may need to consider their limitations. Strollers aren’t always a good choice for orchards so a baby carrier (like an ERGO) would be a good idea for babies. Wagons would be great for toddlers, or a jogging stroller or parent’s shoulders would work for a 2-5 year old. Include family and friends in your apple picking adventure. 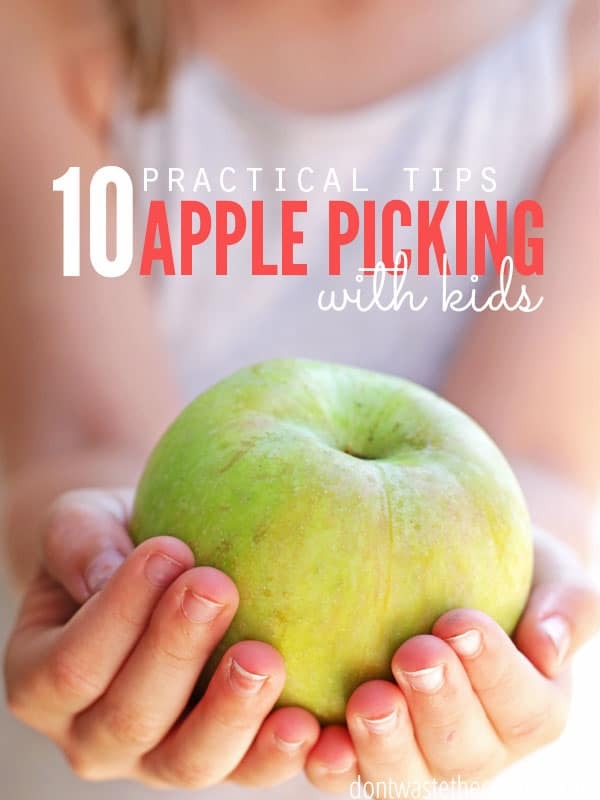 Maybe even make apple picking into a field trip for your homeschool coop. Gathering a group of friends and family to split the bounty can help avoid waste. If your orchard has a playground, farm animals or other attractions, make a day of it and plan those activities into your schedule. Kids will get hungry after all the walking they’ll do collecting apples. Pack snacks or lunch that will complement the fresh apples. Cheddar cheese and crackers, ham slices and nuts or nut butter are all great ideas. Don’t forget water, plates, cutlery, and napkins, and homemade hand sanitizer if you’re not sure you’ll have access to a bathroom to wash your hands. You’d be surprised how many apples you can pick in just a few minutes. If you want to spend a good amount of time picking plan on getting a LOT of apples. Then, plan on what you’ll do with them. Cider? Store them in your root cellar? Give them away? If all else fails, add fresh apples to your meal plan for the next few weeks, dehydrate apples for later and freeze apple pie filling! The apples on the outside of the tree ripen first so stick with those and choose firm apples with no bruises. When picking, roll the apple up instead of pulling straight down and try to leave the stem on if possible (helps the apple to store longer). Also consider how you’ll transport the apples from the tree to checkout. Your harvest will add up quickly, as will the pounds! Or cell phone. Take lots of pictures of the trip, including scenery, and enjoy the day! Remember that trips like apple picking are opportunities to have fun – view them as an adventure (complete with unexpected twists and turns) and I promise you’ll have a great time! Have you ever been apple picking? What tips do you have to share? I’m wondering where in Houston you go apple picking? I checked the orchards in central Texas, and they are picked out already. I would love to get some to dehydrate. This is some really good information about apples and picking them with kids. My nephew will be staying with me for several weeks later this year. I thought we could go apple picking together. So, I liked that you pointed out that you should expect to get a lot of apples. Hi Ivy! Yes, you should get a lot of apples, but remember that the weather effects the harvest as well. Have fun with your nephew!